The Placing of the Venerable Cincture of the Most Holy Mother of God in the Constantinople Blachernae Church was during the reign of the emperor Arcadius (395‑408). Before this the holy relic, entrusted to the Apostle Thomas by the Mother of God Herself, was after Her Dormition thereafter kept at Jerusalem by pious Christians. After many years, during the reign of emperor Leo the Wise (886-911), from the Cincture of the Mother of God was accomplished a miraculous healing of his spouse Zoa, suffering from an unclean spirit. The empress had a vision, that she would be healed of her infirmity when the Cincture of the Mother of God would be placed upon her. The emperor turned with his petition to the Patriarch. The Patriarch removed the seal and opened the vessel in which the relic was kept: the Cincture of the Mother of God appeared completely whole and undamaged by time. The Patriarch placed the Cincture on the sick empress, and she immediately was freed from her infirmity. They served a solemn thanksgiving molieben to the Most Holy Mother of God, and the venerable Cincture they placed back into the vessel and resealed the seal. 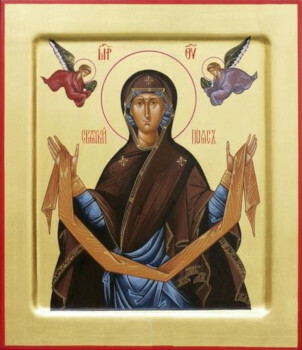 In commemoration of the miraculous occurrence and the twofold Placing of the venerable Cincture, the feast of the Placing of the Venerable Cincture of the Most Holy Mother of God was established.